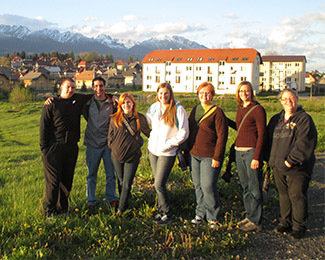 "We spent the semester at HPU learning about the history and culture of the Roma, a minority group in Europe that is often mistreated, and were grateful to get to serve among the Roma in Slovakia and learn from the McNarys' long-term ministry there," Dr. Maxwell said. Ministry activities included teaching English in a local school, leading a daily kids club and planning various evening activities. According to Dr. Maxwell, she and the students prepared both academically and spiritually for the trip. "We studied best practices in short-term missions and prepared for the specific activities we would lead during our trip," she said. "Among other assignments, students kept journals while in Slovakia and submitted a reflection paper after we returned. All of these activities helped class members grow academically as well as personally through the trip. It was exciting to see students grow in their cross-cultural leadership abilities as we served together." The reflection papers reveal the students' improved knowledge of international missions. "The biggest thing I feel I can take as a challenge from this trip is that I need to really try to love everyone as God loves everyone," wrote Mackenzie Gill, a junior from Brownwood. Sean Locker, a senior from North Richland Hills, wrote, "From this trip I've been better able to understand the importance of reading and experiencing different cultures and how it all pertains to global missions. Now that I've seen and experienced so much with my own senses I want to study about the world and its affairs all the more." In addition to Gill and Locker, students on the trip included Faye Lasserre, senior from Brownwood; Rachel Runnels, senior from Paradise; and Jack Wells, senior from Terrell. According to Dr. Maxwell, cross-cultural experiences remind students and faculty alike that God's kingdom is much bigger than HPU, Texas and the United States. "Experiences like this allow us to participate in the work that God is doing around the world," she said. "What a privilege!" Coby Kestner Sauce serves as Director of Media Relations at Howard Payne University.